Who's behind the parody campaign Lincoln 1864? It has come to my attention that your publication -- an obscure journal with a peculiar moniker -- has published a rendering of Mr. Lincoln&apos;s campaign. On behalf of the president, I express my gratitude for your taking interest in our matters. However, as I am unable to acquire a copy of your publication--not even Hamilton Papers & Drugs carries it--I am unaware of the content of your piece. Should you consider the publication of an additional piece on our affairs, do not hesitate in contacting yours truly. The address listed is the address for the Lincoln Home National Historic Site. As far as I can tell, A.M. Chauncey was not actually a person that Lincoln palled around with. Since I fear that snail mail might take a little too long (and end up in the wrong hands), I&apos;ve emailed them this piece. We&apos;ll see how the saga continues. In the meantime, they&apos;re pretty excited about the final presidential debate tonight. The day started like any other: with an email in my inbox from one Ulysses S. Grant, Commanding General of the United States Army, imploring me to vote for Abraham Lincoln and his vice presidential nominee Andrew Johnson in the 1864 presidential election. Wait, what? This email looked familiar -- the letterhead was the same style as those oft-maligned messages from the Obama campaign. But Grant, a man who has been dead for over a century, was asking me to support Lincoln in his debate against George McClellan Tuesday evening, because McClellan was, in Grant&apos;s words, "a real ninnyhammer if I&apos;ve ever met one." Don&apos;t swap horses midstream is a reference to a speech Lincoln gave in 1864 when he said, "I have not permitted myself, gentlemen, to conclude that I am the best man in the country; but I am reminded, in this connection, of a story of an old Dutch farmer, who remarked to a companion once that &apos;it was not best to swap horses when crossing streams.&apos;" It became his campaign slogan and implied that the country should stick with him and with his principals. But back to the modern day: dig around the website and it quickly becomes clear there&apos;s something up here. The "Store" button takes you to the Wikipedia page for "consumerism", "Donate" takes you to a page to help keep up the National Mall in Washington D.C. (where the Lincoln&apos;s Memorial lives). The top right corner links of "Log Cabins" and "Stovepipe Hats" takes you to the magazines Log Cabins Home and a video on how to make your own stovepipe hat. Perhaps the best part is the button that implores you to "Quick Donate 5 cents." The rest of the site includes blog posts mimicking the style seen on the Obama campaign website, like this one, which claims that "Battleground states need you", and requests I give my help and resources towards "Opium administration, miscellaneous wound dressing, minnie ball extraction (bring saws)." Bylines with old-timey names crop up, like S.L. Wiley on this one, though most appear to be random and not actual Civil War-era people. A few other links seem to indicate that a group or Super PAC interested in campaign finance reform might be behind the site, as the headers on it for "Get the facts", "Get the latest" and "Get involved" take you to a Washington Post interactive on the details behind campaign finance, an Atlantic article called "The Last Best Chance for Campaign Finance Reform: Americans Elect", and the Google search results for the term itself. "Are you registered?" takes you to Rock the Vote, and "Sing a Song!" to a video about Lincoln&apos;s 1860 campaign song. 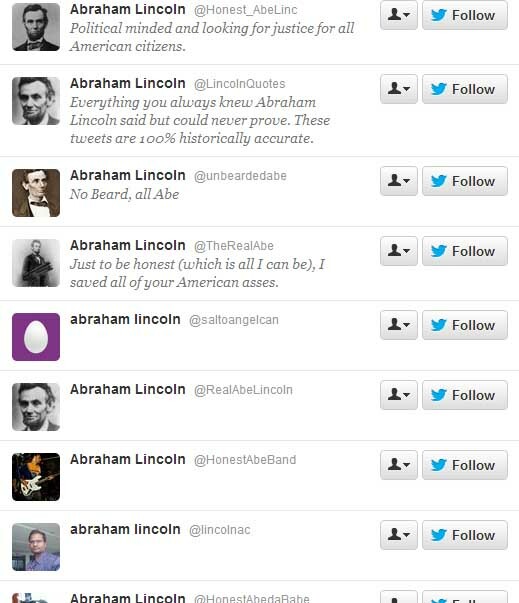 The button to take you to Facebook is just an image, though Lincoln 1864 does have a Twitter account. 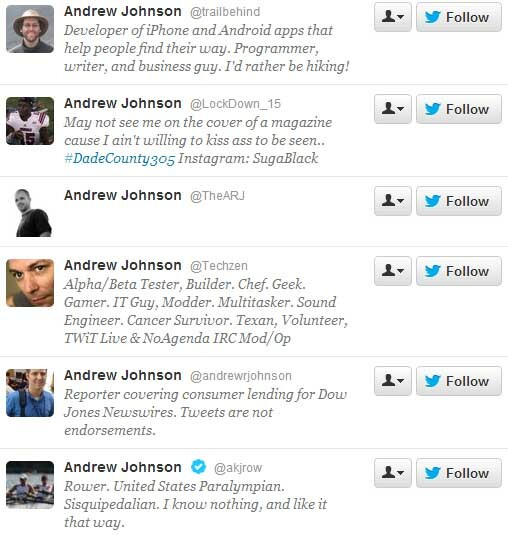 And a well done one at that: check out who they&apos;re following right now. The 800-plus head count consists of primarily, with few exceptions, Andrew Johnsons and Abraham Lincolns. The account&apos;s followers as of now hover around 60, and are mostly random -- people they follow who have followed them back, a few political nerds who have clearly found the site through their close network (including Obama staffers), and spam bots. One exception is Graham "Logo" Smith, a self-described "logo design pioneer, and gun-for-hire" living in England. He&apos;s the first person @Lincoln1864 followed, so I reached out to him to see if he knows anything about the account, but have not heard anything back yet. The domain name for the website is registered as "private", though whoever set it up used Dreamhost as their server. A colleague also suggested the website might be tied to this week&apos;s Newsweek cover, which has Lincoln on it, painting him as "the Great Campaigner." But usually, on stand-alone sites started by media companies, there&apos;s some tie back to the original creator in question, so that they don&apos;t lose publicity. And the only thing I&apos;ve found in the media about Lincoln and campaigning is this post on the New York Times Campaign Stops blog from last week called "Vote Lincoln in 2012." Whoever is behind the campaign, and whatever their reason, is capitalizing on the popularity of our former president that doesn&apos;t seem to be going away. The nation caught the ever-present Illinois Lincoln fever long ago, though President Obama&apos;s fascination with the man has definitely helped "The Great Emancipator&apos;s" popularity. The creator&apos;s intent could be to give Obama boost in the polls, though it&apos;s difficult to say exactly what candidate, if any, they&apos;re supporting, except the cause of humor (and campaign finance reform). The site readily admits it&apos;s satire (a link to "What is this?" takes you to the domain name satire.com), but we still don&apos;t know actually for what purpose -- if any. So if you&apos;re out there campaigning on the Lincoln 1864 trail, take a moment, hit me up, and reveal thyself. Many thanks to Lauren Chooljian, for bringing this to my attention and also being a huge history dork.